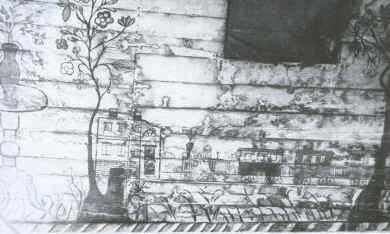 In 1801 the synagogue was built. The synagogue of Pakruojis represents the basic type of synagogue-architecture: the shape derives from the stone fortress synagogues. Whereas most of the Lithuanian synagogues, which have survived, do not represent the “special synagogue architecture”, they resemble more the plain buildings, the local buildings. 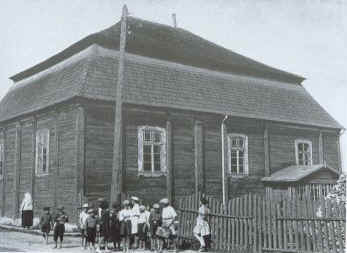 The synagogue in Pakruojis is probably the last sample of the basic type of synagogue-architecture. There was no entrance to the synagogue from the river side. In March 2017 the extensive restauration had been finalised. 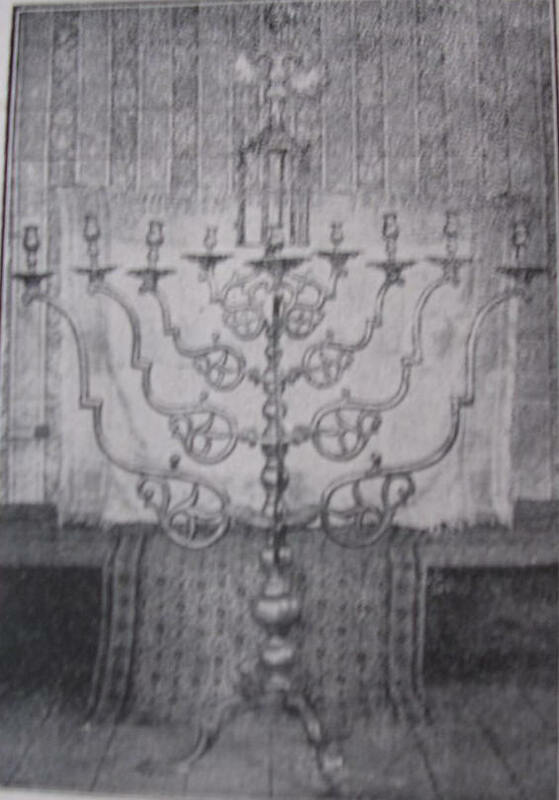 In 1895 the interior of the synagogue was embellished by local Jewish artisans. 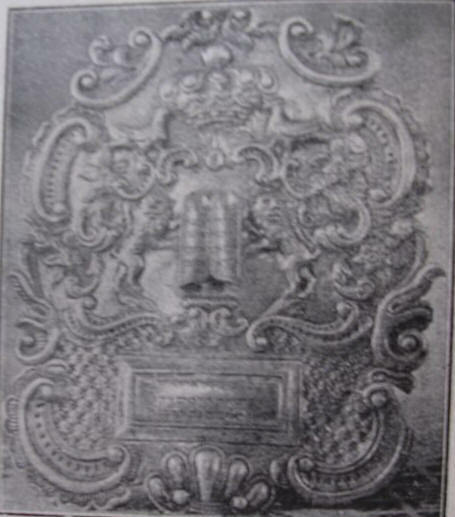 The Aron Hakodesh ( placed always on the eastern wall of the synagogue and containing the Torah Scrolls) was made of wood and beautifully decorated. The master who made the Aron Hakodesh was not from Pakruojis. He was illiterate and very poor. He worked for a very long time on the Aron Hakodesh and was paid by the Jewish community who also offered him a place to stay. There were traditional Jewish decorations representing e.g. a lion and also less traditional decorations of a table with books on it and even a train. All made in a naive and rustic style. The ceiling of the synagogue was even decorated: There were gilded stars to be seen. 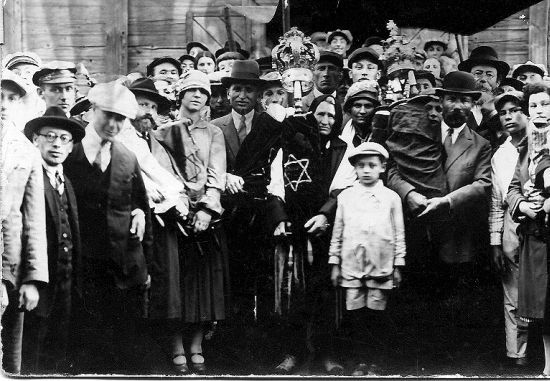 In 1938 the Jewish Historical & Ethnographical Society in Kaunas, headed by its chairman Dr. S. Choroznitsky, together with the Ausros Municipal Museum in Siauliai undertook a study of the shul and commissioned Mr. Chatzkel Lemchen, then a teacher at the Jewish Gymnasium in Kaunas (and later a prominent philologist) to photograph the exterior and interior of the shul. These photographs were preserved by the Ausros Museum. Next to the Aron Hakodesh there was the Bima in the centre of the synagogue from where the men read the Torah. Some years later the family Kramer emigrated to South Africa . Till the Nazi German Occupation in June 1941 the synagogue was the centre of Jewish life in Pakruojis. Bar Mitzvahs were held, marriages (a Chupa) were sealed and prayers in honour of the death were held. All the Jewish festivals were celebrated there. For the Jews of Pakruojis the synagogue was their haven, their inspiration, which cruelly was put to an end by the Germans and their collaborators. R.Haim bar Tuvia Katz. He went to Eretz Israel in 5570/1810 and died in Safed in 5573/1813. 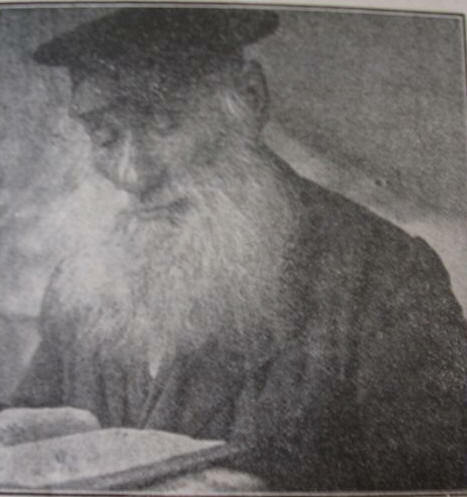 R. Chaim Zalman Kron, In 1925 he was an advisor on Jewish affairs in the Lithuanian Ministry of Interior. He was murdered together with the men of his community in 1941 at Morkakalnis. R. David Ozer Tch(sj)ek(ch)ano(v)sky(ij) who died a natural death around 1940. Reseach project of the Center for Jewish Art Hebrew University of Jerusalem. In cooperation with the ministry of Culture of Lithuania. The field documentation was made possible by a donation in the name of the Morgenstern- Atlas Family and by an anonymous donor. Research: Ivan Čerešnješ, Aliza Cohen-Mushlin, Sergey Kravtsov, Ilona Steimann. After the war, from 1944 on, the synagogue served for all kind of purposes and in 1954 it was transformed into a cinema and a sports hall. The wall paintings could still be intact, they are to be found under the new plaster and stucco when the building was remodelled. 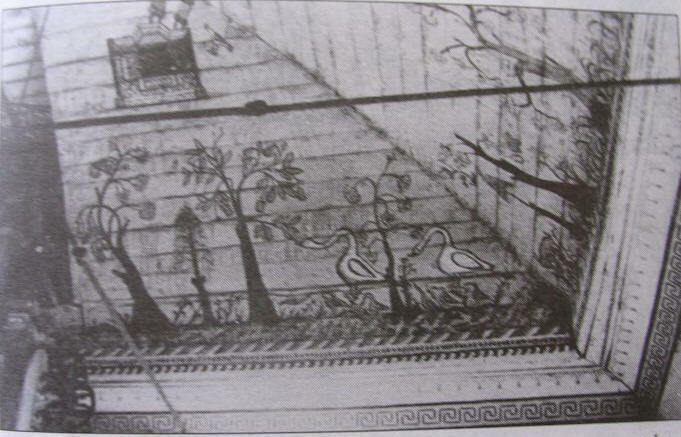 Perhaps the decorations on the ceiling are even intact. But nowadays nothing is to be seen , everything is waiting to be revealed and the building is in a bad shape, now. The man who got the assignment to transform the synagogue was, Jonas Dvelys.